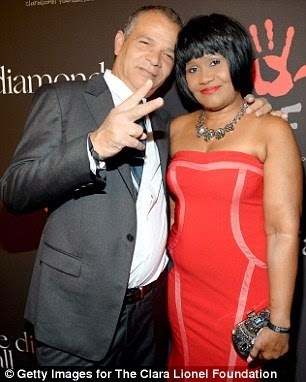 Ronald Fenty, Rihanna's father, is 61 and has battled addiction to alcohol and crack cocaine for years, with an an-and-off relationship with his daughter after he abandoned her with her mother while she was still young. He was in the US recently, invited for Rihanna's Diamond Ball for charity and though he did not get to meet her or talk to her, he had an exclusive interview with UK Daily Mail before he traveled to Bardados. It was a long interview where he mostly talked about how Rihanna put him through a $58,000 Malibu rehab program last year to save him from jail after he was arrested during a previous visit to California. He also opened up about being kicked out of the Diamond ball by Rihanna's mother (with him above) for being drunk and misbehaving. 'I had Johnny Walker Black. I had two doubles man and tripped over a chair. I had been on the [red] carpet for the pictures, I meet a couple of famous people I knew go and talked with them, and then somebody left a chair and I stepped back and fell over, I saw my ex (Monica) look up, and within a few minutes after the picture was taken, security came up and said "we’re taking you home". 'That day of the event I was really down. My other son and daughter in Barbados, Samantha and Jamie, were not invited and they were on my case about it and making me feel bad and guilty. His relationship with Rihanna has often been rocky. Six years ago Ronald was sent home from her North American tour as punishment for drunken behaviour on her tour bus. Rihanna then froze her dad out for two years before they reconciled. Ronald told how his problems with booze came to a head last November and Rihanna secretly put him in rehab. After checking out Ronald returned to Barbados but he has flown back to LA for urine tests every three months. When he comes Rihanna has the mini-bar in his room emptied of alcohol. He has also been attending alcoholics anonymous in Barbados. 'Me, no, drunk and disorderly. I don’t see myself as an alcoholic, I don’t realise when I get that drunk. One thing that annoys him is some of the large entourage of so-called friends she surrounds herself with. 'If it was me she would have to go, if I had anything to do with it she would have to go. She’s the one who goes shopping and everything. 'I think Melissa should be old enough to be able to stand on her own two feet, of course come and visit her like the rest of her friends but she doesn’t need to be there all the time. Ronald has long forgiven Rihanna’s ex Chris Brown for assaulting her and openly admits he still has a big soft spot for him. However he thinks his daughter may have washed her hands with him for good. 'I don’t know what their relationship is now. At the basketball, they just said "hi and hello". 'Let her do what she wants to do. This recycling thing don’t work for everything, people don’t ask me if I could go back with Ms Fenty. 'Chris is a player, he ain’t ready for no one women yet, he ain't ready. He’s a party guy. "When I see in the papers he’s in trouble, I think "Chris what the hell are you doing man?" The guy has got so much talent you know what I mean, to just screw up like that. 'She says "dad can you believe I don’t have a man?" A beautiful woman like that don’t have a man, no I don’t believe it. 'No she's not pregnant, but I want someone to start giving me grandchildren! Of course I want to be a grandfather.